Book – Average to EPIC! 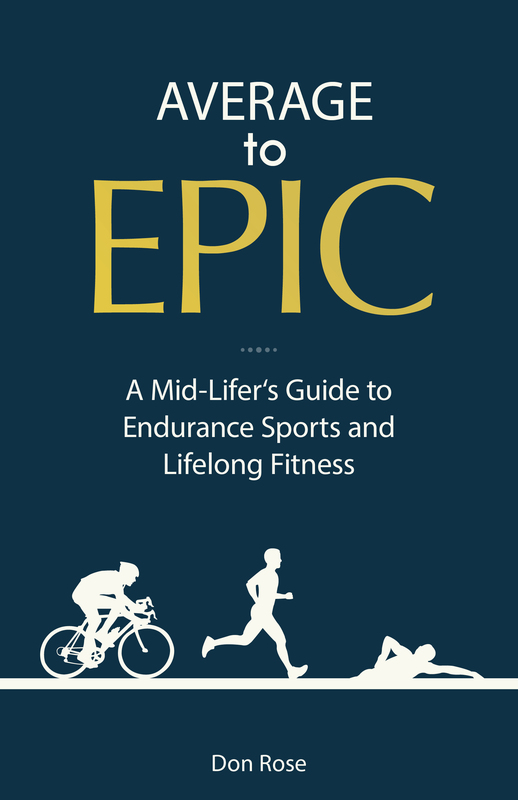 Average to EPIC is an integrated manual for helping men and women transform their lives through endurance sports. Be it riding a bike 100 miles, running a marathon, or completing long-course triathlons, this book provides the resources, practical tips, planning, and motivation for the average person to take on epic athletic challenges. It covers endurance road biking, endurance mountain biking, long distance running, and triathlons. Many middle-aged people want to drastically improve their fitness and overall wellness. Taking that first step is often difficult. Motivation is hard because of time commitments and lack of information, guidance, and experience in endurance sports. Average to Epic provides motivation by demystifying the world of endurance sports and helping the reader take the first steps in getting into one of these sports and training for an epic event. It helps the aspiring triathlete through the murky waters of their first triathlon as they work toward a half-Iron (70.3) or Ironman; takes the non-runner or 5k weekend warrior through the mysteries of running form on their way to completing their first marathon; demystifies the world of cycling to encourage the reader to ride 100 miles on a bike. In doing so, this book helps the reader achieve a broader and more important goal: lifelong fitness.